Are you looking for the most comprehensive trailer training Southampton can offer that will enable you to learn at your own pace? Wayside Transport offers courses for individuals as well as companies at fantastic rates. Call our friendly team of experts today on 01202 873 911 to find out more about our fees and next course availability. If you passed your driving test after January 1st, 1997, then you will need an extra test in order to legally tow a trailer that has a gross weight of 750 kilograms or over. This includes most double horse trailers as well as caravans. 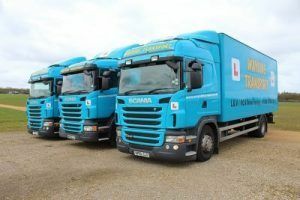 The trailer training Southampton course offered by Wayside Transport will get you road legal in no time. We offer one on one training that is guaranteed to get you ready for your Southampton trailer training test. If you have prior experience with trailers, then your course will likely take a day and a half. You can expect a duration of two and a half days if you have no previous experience. Our handy website has even more information about our company and everything we do besides offering high quality trailer training in Southampton. You will be able to see some high quality images of our impressive fleet of vehicles in our online gallery. Don’t forget to check out our dedicated testimonials page for some genuine feedback from our satisfied past clients who would not hesitate to point you in our direction. Why choose Wayside Transport for your trailer training in Southampton? The Wayside Transport trailer training Southampton method is down to earth and simple. Our approach is proven to work and we are fully up to date with current regulations. You are guaranteed to receive all of the essential know how as well as hands on practical experience. From individuals wanting to expand their job opportunities to companies looking to train several people consecutively, we have got you covered. There are several efficient ways that you can contact the Wayside Transport team in order to book your trailer training in Southampton. Our customer services team would love to walk you through everything involved with getting your qualification. The easiest way to reach our Southampton trailer training experts is by calling us on 01202 873 911. Our opening hours are from 7:30 AM to 6 PM, Monday through to Friday – we look forward to hearing from you very soon. If you would prefer to book your trailer training Southampton online, then you can now do so by filling out the contact form found on our easily navigable website. Just give us a few details about what you are looking to achieve and we will get back to you in a timely manner. You are also more than welcome to send your enquiry related to trailer training Southampton over to the Wayside Transport team via e-mail. Simply send your message over to simon@waysidetransport.co.uk and we will get be in touch shortly using your preferred method of contact.